Nashville, TN -- As the Grand Ole Opry prepares to celebrate the 50th Opry Anniversary of country icon Loretta Lynn with a star-packed Opry show featuring Lynn, Miranda Lambert, Pistol Annies, Crystal Gayle, Lee Ann Womack, and more TONIGHT, fans can celebrate Lynn’s golden achievement in the hours leading up to the show online and on the radio. Nashville, TN -- /Grand Ole Opry/ The Grand Ole Opry® presented by Humana® will honor one its most beloved members, Loretta Lynn, with a Sept. 25 show celebrating her 50th Opry Anniversary. Among the artists scheduled to participate in the celebration are Lynn, her sister Crystal Gayle, plus friends Miranda Lambert, Lee Ann Womack, Trace Adkins, and Pistol Annies, who will be making their Opry debut. Nashville, TN -- /Opry.com/ Country music legend Loretta Lynn announced Thursday evening from the stage of the historic Ryman Auditorium during Opry Country Classics that she has chosen Grammy® and Golden Globe nominated actress and star of FOX TV's hit show, "New Girl," Zooey Deschanel to portray her in an upcoming Broadway-bound stage adaptation of Coal Miner's Daughter. 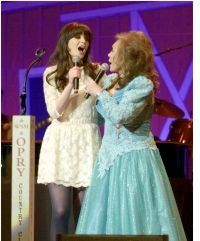 Following the announcement, Ms. Deschanel joined the country music icon onstage for a duet of Ms. Lynn's signature song, "Coal Miner's Daughter."